Thomas Mowles is an engineer, Inorganic Materials Research Division, Lawrence Berkeley Laboratory, Berkeley, California. In Worlds in Collision Velikovsky proposed a physical, catastrophic hypothesis based primarily upon historical evidences (1). Scientists, however, will not accept such a hypothesis unless the physical evidence is compelling, and historians are not likely to interpret their own data in opposition to the "laws of science." Nor will purely theoretical models carry much weight in supporting so revolutionary a hypothesis as Velikovsky's. Therefore, it is necessary to measure physical parameters reliably recorded in the past and currently available for accurate analysis. The radiocarbon dating method offers such parameters, provided its basic premises can be verified. Moreover, since Velikovsky's hypothesis proposes profound geophysical changes, a geophysically-independent "clock" is required to test his claims, and only radioactive carbon decay promises that independence (2) together with sufficient sensitivity during historical times. The radiocarbon dating method is primarily a method of measuring carbon isotope ratios. When the method is applied to samples of inorganic origin, the "dates" reflect primarily the radiocarbon ratio (that is, ratio of carbon 14 to carbon 12) of the samples, neglecting isotope fractionation (see below). When the method is applied to samples that once were living, the ratio reflects the approximate time since the demise of the organism. Thus, analysis of a series of cultural artifacts (organic in origin) can provide a time sequence, or chronology, of events. To yield consistent results, dating measurements must be corrected for the effects of isotope fractionation—the change in isotope ratios when biological or physical processes select one isotope more readily than another. This correction is made by first measuring the ratio of carbon 13 to carbon 12 in the sample. (Since this ratio may be subject to the influence of catastrophes, independent of the radiocarbon, this data can be applied to Velikovsky's claims.) The change in the radiocarbon ratio is then taken to be twice the change in the C13 ratio relative to a current standard, so that any change in the C13 ratio of the atmosphere will be magnified when the correction is applied to a sample. Thus, it has been a primary assumption of the method that the overall C13 ratio of the earth has not changed throughout history. Radiocarbon dating of an organic sample depends directly on the concentration of radiocarbon dioxide in the atmosphere during the time in which the organism lived. Since changes in the radiocarbon concentration would cause inaccuracy in dating, the method assumed that the radiocarbon ratio of the atmosphere has not changed throughout history. It is now known that this has not been the case. Therefore, changes in atmospheric radiocarbon must be determined through a procedure called "calibration." Since Velikovsky's catastrophes would undoubtedly affect the atmospheric radiocarbon, these catastrophes should be evident when the calibration data are analyzed. In calibration, samples which have been independently dated by some other method are then subjected to radiocarbon testing. A comparison of the radiocarbon dates with the independently determined dates enables researchers to formulate a correction factor which they can apply to all further radiocarbon dates. If the dating method used in calibration yields precisely accurate dates, then the radiocarbon method can be calibrated by this means to give absolute, rather than merely relative, dating. The independent dating method most promising for this purpose is dendrochronological (tree-ring) dating of bristlecone pines (3). However, the reliability of this method has not been verified (4). Moreover, the irregular climatic conditions and orbital changes proposed by Velikovsky would invalidate its primary assumptions, namely, that there will be one and only one ring per year; and that throughout history the year length has not changed. Thus, the catastrophes would affect the basic calibration procedure such that radiocarbon dating cannot claim to give absolute dates until Velikovsky's contentions are disproven or until the effects of the catastrophes have been accurately determined. It will be helpful to review Worlds in Collision to abstract that data which should be reflected in the radiocarbon dating method. The earth's near contacts with Venus (5) began with a catastrophic event ca. 1495 B.C. (6), and were followed by another disruption approximately 52 years later (7). A second catastrophic period, during which the earth and Mars interacted (8), began in 776 B.C. (9), with events recurring at 15-year intervals (10). Before this period ended on March 23, 687 B.C. (11), a particularly severe event occurred in 747 B.C. (12). Reduced light levels (13) and noxious pollutants (14) would suppress pine growth, compressing the rings and reducing countability (15). Decades of darkness (16), disruptions in the moisture and temperature cycles (17), as well as seasonal disruptions (18) would undoubtedly alter the tree-ring count (19); and it is possible that large changes in environmental conditions would alter biological isotope fractionation. Volcanic eruptions (20) and combustion of forests (21) would have introduced "old" carbon (of reduced radioactivity) into the atmosphere, diluting the radiocarbon. Further dilution would occur as the ocean yielded up its store of "old" carbon through thorough mixing (bringing deep ocean carbon to the surface) and heating (which would have reduced the carbon dioxide solubility). Since the ocean is the major reservoir of carbon dioxide (22), the result would be great indeed. Such a dilution undoubtedly occurred during the first period (23). Since substantial time is required for the radiocarbon in the ocean depths to "age," this mechanism would not be available during the second period (24). Certain phenomena have not been observed in scientific times: shifted axis of rotation (25); interplanetary electrical discharges (26); and transfers of atmospheric mass between planets (27). It is reasonable to assume that radiocarbon would be influenced by such unique occurrences, although existing theories are inadequate to explain the events themselves, let alone detail their effects on radiocarbon. The effects of axis changes and discharges would be particularly complex and speculative (28). The effect of mass transfers, on the other hand, can be analyzed reliably. To the extent that oxides of carbon were transferred or were the end product of chemical reactions, Carboniferous mass inputs will affect atmospheric radiocarbon. This condition was fulfilled in both periods: through carbon compounds introduced and combusted (29) during the first; and by direct introduction of carbon dioxide (30) in the second. In addition, we must expect carbon isotope ratios on other planets to differ from the earth (data on planetary atmospheric carbon isotope ratios are not available) due to different atmospheres and magnetic fields. Moreover, C13 ratios could be variant (owing to different thermal environments). So it is reasonable to assume that these unique, catastrophic occurrences would produce radiocarbon anomalies, and possibly C13 ratio shifts. Orbital changes were observed during recent history. The available data follow: The earth's orbit expanded substantially during the first catastrophic period (31); the year was 360 "days" long during the interim period (32); during the second period earth's orbit expanded to the current 365+ days (33), and since 687 B.C. the earth has maintained its present orbit (34). But Velikovsky cites no historical records giving the day length during either period under review, and even the year length prior to 1500 B.C. is unknown (35). Clearly, the qualitative implication is that the earth's orbital period lengthened during each interaction; and this change would appear as drift in the calibration so that the radiocarbon age would be younger than the dendrochronological age. There are other ways in which the expansion of the orbit would influence the calibration: the average cosmic ray flux would be increased (increasing radiocarbon production), and the effect of solar flare particles would be reduced (decreasing radiocarbon production) (36), (37). Radiocarbon "date" samples of shallow "petroleum" deposits from around the world. Velikovsky has suggested that liquid hydrocarbons were formed during the catastrophe of ca. 1500 B.C. Such hydrocarbons would most likely be found in near-surface petroleum-like dispersions. If these samples yield measurable "dates" (less than 50,000 years before present) this would seriously weaken the current theories of petroleum formation. If the samples all yielded the same "date," the theory of extraterrestrial formation would be strengthened. Since it is assumed that petroleum formation requires geological ages, published data on the radiocarbon dating of shallow petroleum is limited to the work of P. V. Smith (38). His data is interesting for two reasons: dispersed hydrocarbons which yielded "dates" of 11,800 to 14,600 ± 1400 B.P. were found in recent sediments; and secondly, Velikovsky used this to support his theory (39), despite the insufficient data and the correspondence of the hydrocarbon "dates" with those of the surrounding sediment. Smith's findings indicate that the current theories of petroleum formation (as well as the extraterrestrial mechanism proposed by Velikovsky) should be reconsidered. But more importantly, if Velikovsky's theory is correct, and if Smith did indeed discover residues of planetary interactions, then this data would define the atmospheric reactions during the catastrophe, or the percentage of radiocarbon in the Cytherean atmosphere. The following projections will demonstrate the possibility of quantifying Velikovsky's theories and will indicate the potential extensions of radiocarbon analysis if accurate data become available' Since the data are so limited and since it is not known whether Smith's "dates" were corrected for isotope fractionation (which can be severe in sediments), values are presented only for illustration. Figure 1. Y-axis: measured C13/C12 ratio (in per mil) of dendrochronologically bristlecone pine samples. X-axis: dendrochronological date. Note: the ratios of 43 samples of post-1850 wood are represented by their average value. Error in measurement is shown by the diameter of the dots. Combining Smith's data with Velikovsky's assertion, we find that an event said to have taken place in 1500 B.C. yielded a "date" of 11,000 B.C. The radiocarbon content of the hydrocarbons thus represents a dilution of 30% (1.7 half-lives) from the earth's 1500 B.C. ratio. The hydrocarbon-forming interaction is therefore bounded by two conditions: 1) radiocarbon was provided solely from Cytherean sources. Thus, there could be no reaction incorporating terrestrial carbon, and the Cytherean hydrocarbon must have a radiocarbon ratio of 30% lower than the earth, and, 2) Radiocarbon was provided solely from terrestrial sources. In the reaction between the planetary atmospheres, the Cytherean carbon must have diluted the terrestrial radiocarbon by a precise amount. This requires a ratio of approximately 2.3 Cytherean carbon atoms reacting with each terrestrial carbon atom. The actual interaction must lie somewhere between these two extremes, which gives rise to two major implications: 1) Venus supplied the majority of the carbon atoms during the interaction by a ratio of no less than 2.3 to 1. This ratio could not be sustained if Cytherean carbon-containing species dissociated to species with less than two carbon atoms per molecule (39a). This provides a basis for selecting a reaction mechanism (40). 2) If any reaction occurred with a ratio of greater than 2.3 to 1, then Venus must have atmospheric radiocarbon. It is probable that Cytherean radiocarbon would be measurable today. The source of this radiocarbon would be by a mechanism different from that of the earth (41). Radiocarbon "date" the carbon in lunar samples. Velikovsky proposes that the moon received hydrocarbons formed during the interaction of 1500 B.C., and that these were probably converted into other compounds, particularly carbides (42). It would be expected that these hydrocarbon residues would be on or very near the lunar surface and thus present in the available samples. Since the cosmic flux, solar flux, and lunar surface composition are known, the variation of radiocarbon concentration with depth, on non-Velikovskian assumptions, can be predicted. Deviations from the predicted gradient would be expected if Velikovsky is correct. In this regard, the work of F. Begemann, et al (43) shows that the surface concentration of radiocarbon is significantly higher than predicted; and that either a solar flux three to five times the currently observed value, or new C14-forming reactions must be hypothesized to explain this discrepancy. This anomaly could be explained by several phenomena that can be associated with Velikovsky's claims: transfer of Cytherean atmospheric radiocarbon to the moon; C14 production during the interactions (possibly by the interplanetary electrical discharges); an earth orbit closer to the sun; or an independent lunar orbit around the sun (43a). Clearly, further research is necessary in this area. Check the radiocarbon dates of recent cultural discontinuities and radical changes in natural systems for age correlations. Velikovsky's hypothesis is based on the analysis of worldwide catastrophes (46). If major worldwide disturbances in cultural and natural systems are found to correlate, such correlations would support a general catastrophic theory. If they cluster near 1500 B.C. or 750 B.C. they would support Velikovsky's dating of the catastrophes. In his analysis of the existing data MacKie (47) has indicated that the discontinuities may not be random, as would be expected from uniformitarian principles. But as his analysis relies on dates accumulated by various laboratories (whose methods differed), the accuracy is limited. Clearly, systematic sample selection and radiocarbon determination are needed. Analyze radiocarbon calibration data for changes in the earth's ambient (average) carbon 13 ratio. Velikovsky describes the introduction of extraterrestrial carbon into the earth's atmosphere during the interactions. Since carbon 13 is a stable isotope, it will persist in the earth's inventory. Large carbon inputs exhibiting an isotope ratio different from the earth's would permanently alter the ambient carbon 13 ratio, so that the discovery of an altered background level is compelling evidence for planetary interactions. An unchanged C13 ratio would not weaken Velikovsky's hypothesis because the ratio is considered to be the same for all the planets. Though some older papers include C13 corrections, only sparse data are available on the C13 ratios of the calibrations. Perhaps this analysis is considered routine and not worthy of publication, though this attitude might change if the potential of C13 for verifying planetary interactions were known. The only comprehensive data available are found in the early works of Suess (48), which are plotted in figure 1. However, the data are sparse during the period of greatest interest (1500 B.C. to 50 B.C.). Clearly, data from the current calibration curves are required for evaluation. Considering Suess' data (figure 1), observe, that: 1) Before 1500 B.C. the minimally scattered data show a slightly rising ambient (averaging +2.4 per mil [+.24 percent] from 2450 B.C. to 1500 B.C.). 2) After 50 B.C., the extremely scattered data show a definitely lower ambient that is possibly falling (averaging -3.6 per mil from 50 B.C. to 1850 A.D.). It is obvious that between 1500 B.C. and 50 B.C., the average C13 background dropped 6 per mil, equivalent to 30 times the error in each measurement (0.2 per mil). Massive carbon inputs of a low C13 ratio would explain the changed average and the extensive scatter which has occurred since 50 B.C. The 6 per mil C13 shift would lower the corrected radiocarbon ratio by 12 per mil for samples formed before the shift, so that these samples would appear approximately 100 years older than they actually are. Alternative to this conclusion is the possibility of a 6 per mil systematic error in the C13 determinations which, if true, would bring in question all the dates associated with the error. It is necessary to confirm the shift or determine the extent to which these errors have been incorporated into the existing calibration; publication of the complete data of the calibrations is of foremost importance. It should be recalled that the measurement of the C13 ratio is independent of the assumptions of radiocarbon dating which are currently in question. Thus the available data strongly support Velikovsky's catastrophes independent of the other aspects of radiocarbon analysis. Figure 2. From Suess. Y-axis: apparent deviation of atmospheric radiocarbon ratio (in per mil) of measured C14 content in dendrochronologically bristlecone pine samples from an ideal constant (1850 wood) using a 6739-year half-life after removing the drift from the best-fir sine wave shown in figure 3. X-axis: dendrochronological date. Note: correlations with recognized climate periods are indicated at the top of the figure. Accurately analyze bristlecone pine samples in small increments around 1500 B.C. and 750 B.C. In the events described by Velikovsky, changes in atmospheric radiocarbon concentration are unavoidable, and though it is difficult to project the extent and duration of such anomalies, they would not occur without being noticed in the calibration. If definite anomalies are found, then the hypothesis is supported. Only Suess (49) has claimed clarity and sensitivity sufficient to analyze the calibration for the expected anomalous effects, but it is disputed whether this sensitivity is justified by the method at the current time (50). A definitive test of Velikovsky is possible because of his claim that the planetary interactions were repeated within each anomalous period. Thus, if the 1500 B.C. anomaly shows two peaks separated by approximately 50 years, or if the 750 B.C. anomaly shows multiple peaks every 15 years, then this confirms the hypothesis. Such a fine-structure analysis would stretch to the limit the sensitivity of the radiocarbon method. But even with sufficient sensitivity, the 15-year recurrence would not appear if the Pine samples were larger than 5-year segments (51) or if the samples were not chosen to coincide precisely with the anomalous peaks and valleys rather than part way between. In spite of the uncertainties in the calibration procedure, Suess' calibration (52) should have sufficient sensitivity to show large anomalous variations in the atmospheric radiocarbon concentration. Unfortunately, the "data" are published only in graph form, so that precise analysis is not possible. In figure 2, the calibration graph has been presented showing the atmospheric radiocarbon as a deviation from the ideal constant value, after removing the drift component using the best-fit sine wave (discussed below). Considering the period about 750 B.C., Suess has remarked, "A most conspicuous and so far unparalleled irregularity in the ΔC14 as a function of time is the rapid C14 increase at the beginning of the 8th century B.C. and the sharp maximum between 780 and 770 B.C. (53)." This anomaly strongly correlates with Velikovsky's second catastrophic period, which began in 776 B.C., and, being positive, implies that interactions with Mars were indeed dominated by some combination of the "unique" effects previously mentioned—shifted axis of rotation, electrical discharges, and mass transfers. Next, considering the period around 1500 B.C., although the clarity of the curve decreases near 1000 B.C., a sharp minimum is still visible at approximately 1550 B.C. Though not ideally shaped, this minimum is nonetheless the largest sharp minimum in the calibration; and correlates strongly with Velikovsky for two reasons: 1) The position of the minimum correlates well with Velikovsky's 1500 B.C. date, which implies that the ring-count was not systematically disturbed between 1500 B.C. and 750 B.C., the displacement being only 50 years (54). 2) The negative deviation of the anomaly supports the date in Worlds in Collision which imply that the Venus interactions were dominated by dilution effects (55). The available data support Velikovsky and indeed Velikovsky's claims can be used as an independent check of the reliability of the bristlecone pine calibration. Analyze the calibration for orbital drift components and compare this drift with best available estimates of historical year length. Velikovsky claims that the planetary interactions changed the earth's orbit (and thus year length). Changes in the year length would produce a deviation between the calendar and radiocarbon dates which would appear as a nearly linear drift (57) in the calibration graph. The effect would be similar for both historical calibrations (using Egyptian samples, for example) and the bristlecone pine calibrations. It is well known that both the Egyptian and bristlecone pine calibrations drift substantially before the late centuries B.C. Historical data on the year length should be compared with this drift. At the present time the comparison is limited because: the historical year length has not been determined; uncertainties in the currently available data do not allow for accurate determination of the drift; and year-length changes are probably not the sole cause of drift. 1) The geomagnetic sine function has a period that is significantly shorter than Suess' sine function. 2) The amplitude of the atmospheric radiocarbon deviations that would result from the observed field fluctuations has not been determined (60). 3) The above sine functions have an unacceptable phase relationship because the atmospheric deviation maximum precedes the field maximum. 4) The radiocarbon calibration data do not expressly indicate a sine function deviation because: the function has not completed a full period; ancient data are sparse; and the drift in the recent data is uncertain. Indeed, the MASCA (61) and Arizona (62) calibrations show negligible sinusoidal character. Velikovsky's proponents usually explain the drift by assuming that orbital changes occurring at 1500 B.C. and 750 B.C. caused a linear drift in the calibration. The data are analyzed to give the best-fit linear drifts. Then, the slopes of those drifts are converted to year lengths, which are compared with Velikovsky's estimates. Using this approach, a year length of 290 ± 20 days can be interpreted for the period before 1500 B.C. ; and a year length of 320 ± 50 days is found for the interim period. The direction of these drifts are as predicted by Velikovsky and their magnitude does not conflict with his estimates. However, this explanation also contains difficulties: 1) If Suess' calibration is used, a sine wave function is a substantially more satisfying explanation. 2) Due to extreme scatter, many possible lines can be drawn through the data; thus, a quantitative definition is almost useless (63). 3) The year-length of the interim period must be less than present, in order to yield the observed direction of slope. Figure 3. From Suess. Y-axis: apparent deviation of atmospheric radiocarbon ratio (in per mil) of measured C14 content in dendrochronologically bristlecone pine samples from an ideal constant (1850 wood) using a 6739-year half-life. X-axis: dendrochronological date. Note: curve drawn through points is best-fit sine wave (period 10,350 years amplitude 50 per mil. We wish to discuss the possibilities for new understanding of the calibration drift, harmonizing the two previous positions. Speaking of the relationship between the radiocarbon fluctuation curve and the curve of fluctuation expected solely from geomagnetic field changes, Suess has said: "If you wish to bring the two curves into even more perfect agreement, then you have to assume an additional third component, consisting of an exponential or linear decrease of the C14 level. The oscillation caused by the change of the geomagnetic field is superimposed upon this component. Then you get precisely the same period and expected phase-lag for the two curves" (64). But whereas Suess concludes "There should be other factors that affect the C14 level, but these factors cannot be recognized at the present time" (65), we propose that the orbital changes of Velikovsky account for this missing component. In order to determine the plausibility of this proposal, Suess' radiocarbon deviation curve was compared with the sum of the orbital drift and the radiocarbon fluctuation curve resulting from the geomagnetic field variations. The comparison was made in the following steps: 1) The ΔC14 scale of Suess' sine function was shifted so that zero would be the current (1950) value. 2) Since 687 B.C. the geomagnetic field variations would have been the sole cause of the radiocarbon deviation, so these two curves can be directly compared, yielding these results: a) The position of the radiocarbon minimum lags behind the geomagnetic minimum by 250 years. The field function was shifted by this amount to represent the phase-lag between the field and atmospheric radiocarbon changes; b) The equation of geomagnetic field fluctuations was solved for amplitude under the conditions that the value in 1950 would be zero, and that the value at the minimum should agree with Suess. This resulted in an amplitude of 36 per mil. 3) Between 1500 B.C., and 750 B.C., there was a small orbital drift component resulting from the 360 day year length. 4) Before 1500 B.C., there was a large orbital drift caused by an orbit of undetermined year length. This year length was evaluated by selecting the value that most nearly matched the discrepancy between Suess' deviation and the field-produced deviation. The result was a 335-day year (66). 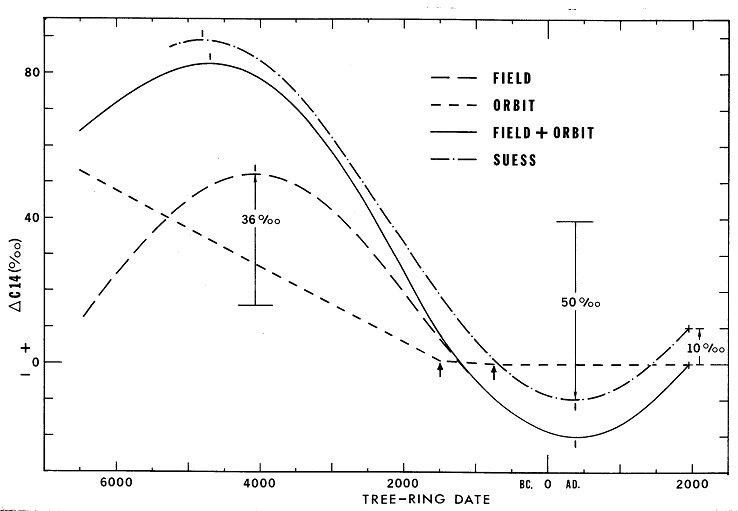 5) The field and orbital components were summed for comparison with Suess' deviation. The resulting sum curve agrees excellently with Suess' deviation (see figure 4, noting that Suess' curve has been displaced 10 per mil for clarity). It is unnecessary to justify the residual discrepancies between the two because the agreement is already better than can be expected from the data (see figure 3). And this close agreement justifies the use of figure 2 for the previous analysis. This approach resolves the limitations of both previous positions: (Case 1) The amplitude of the field-produced deviations has an acceptable value; the sum curve closely approximates Suess' deviation curve in amplitude, period, and phase; and the sinusoidal character of the calibration is maintained. (Case 2) The year lengths are in agreement with Worlds in Collision data without requiring a linear drift assumption; the interim year length is less critical because geomagnetic field variations dominate during this period; and the year length before 1500 B.C. is precisely determined (if the geomagnetic function is known). Since Velikovsky's orbital changes explain the current discrepancy between the theory and observation of the radiocarbon drift, Velikovsky's hypothesis and current drift theories support each other. Further work would be required to determine precisely the geomagnetic function, to extend the calibration to more ancient samples and to clarify the position of the calibration maximum. A computer should then be used to compute the true year lengths considering other effects of the catastrophes. After the drift curve is well determined, the anomalous peaks could be analyzed quantitatively to evaluate the effects of the planetary interactions. Figure 4. Y-axis: apparent deviation of atmospheric radiocarbon ratio (in per mil) of measured C14 content in dendrochronologically bristlecone pine samples from an ideal constant (1950 value of sine wave shown in figure 3) using a 5730 half-life. X-axis: dendrochronologicall date. Field Curve: sine wave of atmospheric radiocarbon ratio deviation resulting from changes in the geomagnetic field is shown for the period of time for which data are available (period 8900 years; amplitude 36 per mil; phase-lag 250 years). Orbit Curve: apparent radiocarbon ratio deviation produced by changes in orbital period resulting from Velikovskian catastrophes ca. 1500 B.C. and ca. 750 B.C. (Present orbit since 750 B.C. ; 360 day period from 1500-750 B.C. ; 335 day period prior to 1500 B.C.). Field + orbit curve: sum of orbit and field curve. Suess curve: best-fit sine wave for apparent atmospheric radiocarbon ratio deviation measured by Suess is shown for the period of time for which data are available. Suess curve is shown offset by 10 mil for clarity of the figure. Note: data of maximum and minimum deviation are indicated. The radiocarbon dating method has been shown to be uniquely applicable to the evaluation of Velikovsky's hypothesis. However, much available data which pertain to this evaluation remain unpublished. This is unfortunate, because Velikovsky's catastrophes invalidate several basic assumptions of the dating method and its calibration. Moreover, several assumptions of the method are currently in question on other grounds. Without public data, there is no way to determine the reliability of Suess' calibration curve, which this research indicates may be suspect. In light of this, the fact that Suess' calibration is actively promoted without substantiating data is reprehensible. The data which are available support Velikovsky, often strongly. Further research would be justified on these grounds alone. Also, Velikovsky's catastrophes provide an explanation for several unresolved theoretical difficulties and the potential for independent verification of the bristlecone pine chronology. Further, Velikovsky opens up new applications for the radiocarbon dating method. In order to command the continued support of the scientific community, the basic premises of the radiocarbon dating method must be verified. Therefore, Velikovsky's hypothesis must be specifically tested; the method cannot claim to give absolute dates (even if calibrated) while this remains undone. And confidence in relative dating would surely suffer if such a fundamental historical and technical problem were ignored. In short, it is in the best interest of those institutions performing radiocarbon analysis to give careful consideration to Velikovsky's hypothesis. (1) I. Velikovsky, Worlds in Collision (Doubleday, 1950). (2) This independence has recently been called into question by J. L. Anderson ("Non-Poisson Distribution Observed During Counting of Certain Carbon-14-labeled Organic (sub) Monolayers," Journal of Physical Chemistry, 76 [19721, 3603-3612). Until more comprehensive knowledge of carbon 14 decay dependence is available, this appears to be a satisfying assumption. (3) C. W. Ferguson, "Dendrochronology of Bristlecone Pine, Pinus Aristata: Establishment of a 7484-year Chronology in the White Mountains of Eastern-central California, U.S.A.," 1. U. Olsson, ed., Nobel Symposium 12: Radiocarbon Variations and Absolute Chronology (J. Wiley, 1970), pp. 2 37-245. (4) H. C. Sorensen, "The Ages of Bristlecone Pines," Pensée, this issue (Spring-Summer, 1973). (5) I. Velikovsky, Worlds in Collision (Dell, 1967), p. 264. (10) Ibid., pp. 244, 365, 264. However, the dates specifically mentioned indicate a 30-year cycle, which may imply that occurrences were of alternating severity. (15) In the only specific mention of ring countability, Ferguson says "The total tree-ring record of Pine Alpha has not yet been worked out because of a compressed interval between 1700 and 1250 B.C." From Ferguson, op. cit., p. 243. (16) I. Velikovsky, op. cit., p. 139. (17) Ibid., pp. 139, 105. (18) Ibid., pp. 132, 316. (19) Since all trees in a region would be similarly affected, cross-correlation will not eliminate the error. (20) I. Velikovsky, op. cit., pp. 105, 315. (21) Ibid., pp. 11 4, 315. (22) Libby, " History of Radiocarbon Dating," Radioactive Dating and Low-Level Counting (I.A.E.A., Vienna, 1967), p. 7. (23) I. Velikovsky, op. cit., pp. 105, 85. (24) It is probable that the deep ocean has not yet equilibrated. This would help explain discrepancies in current theoretical calculations which assume equilibrium conditions. (25) I. Velikovsky, op. cit., pp. 128, 225. (26) Ibid., pp. 100, 277. (27) Ibid., p. 67ff., 240. (28) Velikovsky has claimed that inter-planetary discharges would alter nuclear structure, producing radioactivity, Ibid., p. 369. (30) Ibid., p. 240. Assuming that carbon dioxide is the major constituent of Martian atmosphere. (33) Ibid., pp. 225, 333. (35) In order to relate past orbital periods to the present, it is necessary to know both the number of "days" per year and the relative length of each day. The year-length expresses both these considerations in terms of undetermined corrections. (36) Because of these factors, the drift and the year length are not equivalent and suitable correction factors must be applied. No attempt has been made in this work to apply these corrections. (37) Also, the effect of solar modulation on the cosmic ray flux would be reduced (thereby reducing the amplitude of the short-period oscillations). These oscillations with a period of approximately 400 years are superimposed upon the calibration drift, according to Suess, “The Three Causes of Secular C14 Fluctuations, Their Amplitude and Time Constants," 1. U. Olsson, op. cit. 595-604. Though these oscillations were apparent in this early calibration, they are not so clearly shown in the recent calibration (figure 2). No explanation was given. (38) P. V. Smith, /i>(1952), 437-439. (39) I. Velikovsky, "Venus - A Youthful Planet," Yale Scientific Magazine (April, 1967), 8. (39a) Unless the total amount of Cytherean carbon oxides was greater than 2.3 times the total amount of earth's atmospheric carbon oxides. (40) W. K. Kuong, "The Synthesis of Manna," Pensée (Winter, 1973), 45-46. (41) Venus has only traces of nitrogen. Ammonia may be the source of nitrogen or a non-nitrogen reaction may predominate in its absence. (42) I. Velikovsky. "Are the Moon's Scars Only 3000 Years Old?," New York Times, early city ed. (July 21, 1969). Reprinted in Pensée (May, 1972), 14. (43) F. Begemann, et al, Proceedings of the Third Lunar Science Conference, 2 (M.I.T. Press, 1972), pp. 1693-1702. Later confirmed by R. S. Boeckl, Earth and Planetary Science Letters, 16 (1972), 267-272. (44) Velikovsky, Ages in Chaos (Doubleday, 1952 ). (45) "Resolution Adopted by the Twelfth Nobel Symposium," 1. U. Olsson, op. cit. (46) I. Velikovsky, Worlds in Collision (Doubleday, 1950) and I. Velikovsky, Earth in Upheaval (Doubleday, 1955). (47) E. W. MacKie, "A Quantitative Test for Catastrophic Theories," Pensée (Winter, 1973), 6-9. (48) H. E. Suess, "Secular Variations of the Cosmic-ray-produced Carbon 14 in the Atmosphere and their Interpretations," J. Geophys. Res. 70 (1956), 5937-5952, and "Bristlecone Pine Calibrations of the Radiocarbon Time Scale from 4100 B.C. to 1500 B.C.," Radioactive Dating and Methods of Low-Level Counting, op. cit., 143-151. (49) H . E. Suess, "Bristlecone-pine Calibration of the Radiocarbon Time Scale: 5200 B.C. to the Present," 1. U. Olsson, op. cit., pp. 303-308. (50) Discussion of H. E. Suess paper above cited and "General Discussion of the Magnitude of the C14/C12 Variations," I. U. Olsson, op. cit., pp. 309-311 and 327-333. (51) Normally, 10-year segments are the smallest used, due to the extreme compression in the rings. This difficulty may possibly be circumvented by the use of low-sensitivity pine or sequoia gigantea samples. (52) From H. E. Suess, Climatic Changes and the Atmospheric Radiocarbon Level," Palaeogeography, Palaeoclimatology, Palaeoecology, 10 (1971). 199-202. (53) H. E. Suess, "The Three Causes of the Secular C14 Fluctuations, Their Amplitudes and Time Constants," 1. U. Olsson, op. cit., P. 602. (54) Opposed to this is Suess' indication (ibid.) that between 1400 B.C. and 400 B.C. there was an addition or deletion of approximately 200 years. (55) The dilution and "unique" effects would tend to cancel each other out, reducing the magnitude and sharpness of the peak. (56) This peak could not be associated with the 1500 B.C. occurrences unless systematic double-ring years occurred in the interim period. (57) The equation is of the form ΔC14» exp(-kmt/T), where k is a constant, m expresses the year length, t is the tree-ring date, and T is the C14 half-life of 5730 years. Since T is very large with respect to km, the curve is almost linear. (58) V. Bucha, "Influence of the Earth's Magnetic Field on Radiocarbon Dating," I. U. Olsson, op. cit., P. 501-510. This work represents the most consistent data available and the sine function is clearly defined. (60) Suess has chosen a value of 50 per mil to agree with his deviation (Ibid., p. 600). However, the theory of Elsasser does not give acceptable quantitative results (Ibid., P. 608). (61) E. K. Ralph and H. N. Michael, "MASCA Radiocarbon Dates for Sequoia and Bristlecone-pine Samples," 1. U. Olsson, op. cit., pp. 619-623. (62) P. E. Damon, et al. "Arizona Radiocarbon Dates For Dendrochronologically Dated Samples," 1. U. Olsson, op. cit. , pp. 615-618. (63) Try for yourself using Libby's figure 1, in this issue of Pensée. Remember that the true year length will be approximately 3 percent longer than the graph indicates, because of the conventional, but incorrect, half-life used in this plot. (64) H. E. Suess, discussion following "Climatic Changes of the Secular C14 Fluctuations, their Magnitude and Time Constants” I. U. Olsson, op. cit., p. 604. (66) This result is fairly insensitive to the change in the value of the interim year length: an interim orbit of 350 days changes this to 337 days, and a 425 day interim orbit changes this to 324 days.